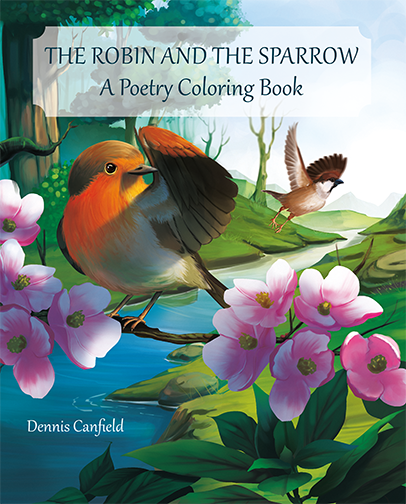 Robin Brooks at The Beauty of Books enjoyed herself so much when she designed the cover for the coloring book The Robin and the Sparrow. This is a delightful series of poems written by Dennis Canfield and told to his daughter when she was three. It is also a coloring book. Working on this with Dennis was a treat. The fanciful drawing for the cover was executed in Asia, and it was so refreshing to create the few design elements to go with it. Inside, to illustrate each poem, is also a black and white drawing by the same Asian artist. This is not Dennis's first book for children. He has also written Back to Christmas for young adults.